“Rescue Me” is a recurring column by Samantha Randall, editor-in-chief at Top Dog Tips. She provides personal anecdotes and perspective about her life as a pet lover with a passion for cat and dog rescue. Today, she talks about the numerous ways you can help your local animal shelters without taking home the responsibility of a new pet. I often hear pet lovers express a desire to help a rescue or shelter organization, but they aren’t able to adopt a pet. My response? No worries! There are lots of ways to help your local pet rescue or animal shelter without adopting. Of course, volunteering is the most effective way to help without adopting. You don’t need to volunteer for eight-hour shifts or spend every Saturday cleaning kennels and walking dogs. If you have just a few hours per week to donate, speak with a member of the shelter team and let them know what you can do. Often, shelters are happy to have a volunteer come in for just a few hours to help clean, organize, help with special events, walk dogs, help to socialize the animals, and so much more! But I know how busy life can be. Some of us just don’t have a few hours to spare each week. If you’re in this category, check out these easy ways to help your local pet rescue or animal shelter without having to be so hands-on with the animals. Sign up to be an animal transporter – This is a huge help to shelters who accept and rescue animals from outside their local area. Typically, transport volunteers sign up for a particular “leg” of a transport. For example, if a dog needs to be transported from Florida to Maine, the shelter looks for transport volunteers in every state along the way. Become a foster parent – I know, this sounds a lot like adopting, but hear me out. While you may not have the time or money to support an animal full time for the rest of its life, maybe you can foster animals during certain times of the year when you’re home more often. Maybe you wouldn’t mind committing to an animal for a few months, but you’re unsure of whether or not you want to commit for the next ten years or more. Fostering is a great way to help your local rescue or shelter without committing to adoption. Donate items – Every shelter has a “wish list” and a “needs list.” Things on the needs list may include food, bedding, treats, collars, leashes, etc. It is a list of items that the shelter uses every day to care for the animals. This list is always growing and changing, so be sure to contact your local shelter or follow them on social media to stay up-to-date with their current needs. A wish list is filled with bigger items that the shelter is currently saving for. These items may include new kennels, office supplies, furniture, etc. Again, this is an ever-changing list, so check in with the shelter before buying anything. Follow the organization on social media and share, share, share! This might be the easiest thing that you can do to help your local shelter or rescue. We’re all on social media throughout the day. Why not follow your local shelter and help to spread the word about pets that are up for adoption, upcoming events and any needs that the organization may have? Encourage others to help – Just because you can’t volunteer or adopt doesn’t mean that your friends and family can’t. If you know someone looking for a new pet, encourage them to adopt. Is your neighbor having a yard sale? Speak to them about donating any items that the shelter could use, like towels, bedding and items that their pet no longer uses. Ask for donations – If you’re shopping at your local pet store or office supply store, ask the manager if they’d be willing to donate items that the shelter may need. You’d be surprised how many boxes of paper and chew toys you could get donated just by taking a few minutes to ask. Share your talents – Do you have a knack for carpentry or photography? Are you crafty? Your talents may be of use to your local shelter. You may be able to help build scratching posts, sleeping boxes or benches. You may be able to help with maintenance projects around the shelter. Could you take creative pictures of adoptable pets? This is likely to get them more exposure on social media and, in turn, get them adopted faster. If you’re crafty, you could make homemade toys, leashes, collars, beds and any other DIY pet product that you can think of. Help with fundraising efforts – Have a birthday, wedding or other special event coming up? Ask for donations to the shelter in lieu of gifts. Would your coworkers be interested in donating to a local rescue organization? Ask if you can put up a donation jar in the break room or in an area where everyone can see it. Do your children attend a local school? Speak with the administration about doing a fundraiser for the shelter. You could print flyers to send home with the children and put collection boxes in each classroom. Search the internet – Look through Craigslist, Freecycle and other sites that offer items for free. If someone is giving away an item that the shelter could use, pick it up and donate it! Walk – Yep! With the ResQwalk app it’s that simple! The app is free to download and allows you to choose a shelter or rescue group in your area. Every month they announce the ResQpool of money that they’ve received from sponsors and other resources. All you have to do is walk, and you’ll earn part of the pool for the organization of your choice! 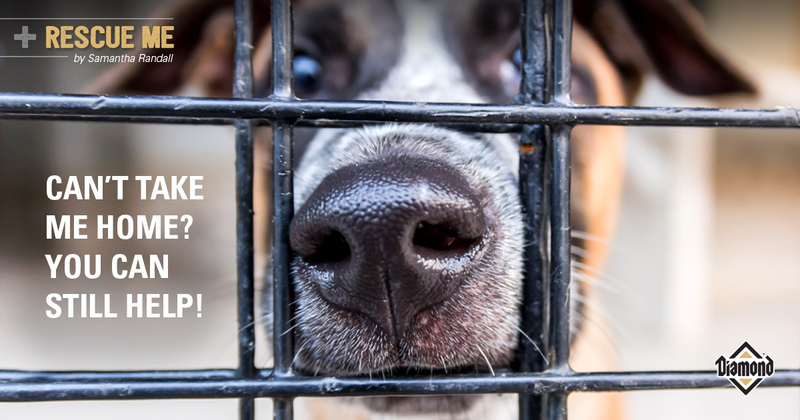 Help out at home – You can help your local shelter simply by ensuring that your pet never ends up there as a stray! Make sure that your pet has identification via a microchip or ID tags. If the shelter is able to ID and return more pets to their rightful home, they have more space for animals that are truly in need of shelter. Say “Thank you!” – Working at a shelter or rescue organization can be a tiring and thankless job at times. Remember that no matter how hard they try, the workers at these organizations cannot please every customer, and they cannot save every pet. It’s also not a job that is going to make anyone wealthy. Stop by with coffee and doughnuts, order lunch for the team or just send a thank you card once in a while to let the staff know that they are appreciated! Many of us love pets and want to help even the ones who don’t (yet) have a home. With a little effort and not necessarily a lot of time or money, anyone can pitch in and lend some love.